The FLEXI-POWER™ High-Pressure Gas Compressor is used for high pressure testing, alternative refueling, high flowrate research applications and heavy duty industrial applications. Standard units are available for discharge pressures of 10,000 to 60,000 psig (70 to 415 MPa) in frame sizes from 10 to 100 hp (7.5 to 75 kW). Two-stage FX compressors typically operate with inlet pressure ranges of 500 to 3,000psig. Single-stage compressors operate on an 8:1 compression ratio. These compressors can be customized for specific pressures, capacities and applications with simple modifications. Custom units are available for pressures greater than 60,000 psig (415 MPa). Standard options are available for control and piping systems. Full stroke-length distance pieces isolate the hydraulic drive from the gas cylinders. FLEXI-POWER™ operation increases capacity at lower operating discharge pressures providing a more efficient, faster fill. Quick change packing design allows the high pressure seals to be changed in less than an hour. Intensifier mounted over power unit. Easily removable, sound dampening panels to enclose the hydraulic drive section and reduce noise. 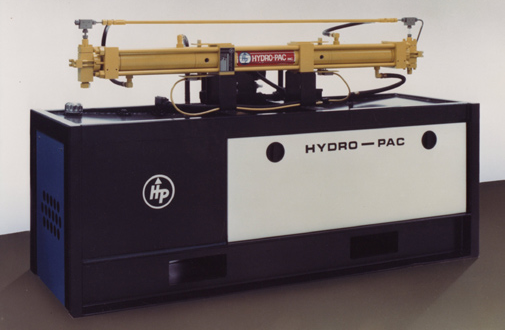 Hydro-Pac gas compressors work over a wide range of inlet pressures. In many cases inlet pressure regulators are not required. Materials compatible for high pressure operation. Intensifiers are ideally suited for high pressures due to the simple geometry, slow operating speeds and in-line loads. Long slow stroke and small dead volume in the compressor cylinders result in high volumetric efficiency. Water cooled gas cylinders lower operating temperatures, which increases packing life. Hydraulically driven intensifiers allow control of both discharge pressure and gas flow rate by controlling the hydraulic drive. This may be important when matching the flow rate of the compressor to that of a reformer or electrolyzer. Gas pressure assists in the compression stroke improving the overall efficiency of the machine. Many other applications that require clean gas.